Letter to the Editor: The end of an egret nursery? Home/News/Letter to the Editor: The end of an egret nursery? 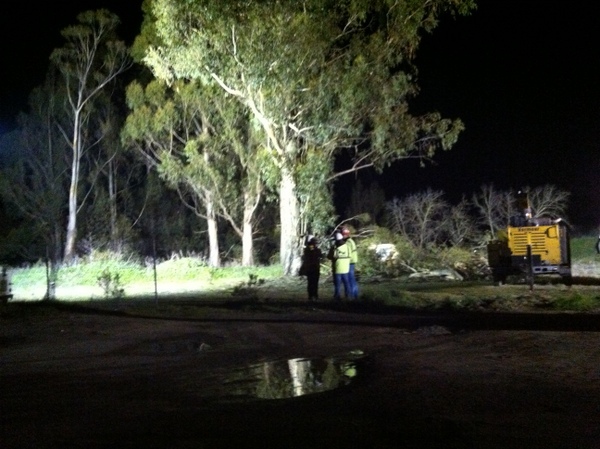 Dave Keller of the Petaluma River Council snapped this photo Sunday night of a tree-cutting crew just east of the northbound Highway 101 exit onto Petaluma Boulevard South, and sent the following letter to supporters of his campaign to protect this grove of trees. CalTrans officials could not be reached for comment Sunday night. Tonight, under the cover of Sunday night darkness, Ghilotti Construction, CalTrans and a tree crew are chainsawing the grove of the heron and egret rookery. I suspect that the entire grove will be leveled by morning. Attached are 2 photos from about 6:45 p.m. tonite. There are logging crews and log moving heavy equipment operating under banks of floodlights. It is disturbing that CalTrans’ contractor for the Petaluma Boulevard South interchange would take the added safety risk of dropping these large trees at night. Were they afraid of having the community’s presence and witness of this destruction? The loss of this established egret and heron rookery, in clear view for thousands of Shollenberger Park visitors, school children and bird-watchers from around the country represents a failure of not only CalTrans, but also of key local representatives and Sonoma County Transportation Authority to recognize, understand and protect this valuable local treasure. As of now, there is still not only no plan for replacing the grove for potential future rookery sites, but no commitment from CalTrans to even contribute any funds towards that goal. We will continue to battle the plans for an asphalt plant at this location in the Court of Appeals. However, we are very disappointed that this remarkable natural attraction has been lost to poor planning and errant decision making. What Dutra could not have done for their project, CalTrans has done with impunity under the cover of darkness.